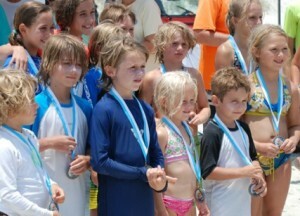 The Club’s Seaside Fiesta and Spooktacular surf contests always include Tadpole division events. The article shown below was posted for our 2011 Kona Pro contest but still provides a good overview of the Tadpole Division contests. Tadpoles will receive a free contest t-shirt, plus custom trophies to winners, and the entry fee is $10 for kids 11 and under with push-in by parents only. 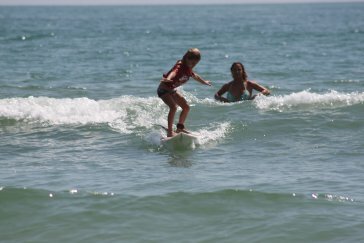 In the context of surfing, our youngest surfers have been given the nickname of Tadpoles. While lacking the external gills, they are also in the process of their metamorphosis into adult surfers. Unlike in nature, they are watched closely in the water by their parents, who push them into the waves at a tender age before they have learned to catch them on their own. “Our goal is to produce the most family-friendly event we can,” continued Surfari Head Judge Tom Wright (and original Surfari Club Member). “We will get the competition started as soon as possible, and have the kids surf one time, before they start shivering.” In addition to a prize medallion that every competitor will receive, the surfers with the top scores from all the heats will receive one of the coveted, hand-made trophies that the Surfari events are known for. 2010 was another successful year for the Smyrna Surfari Club, which now makes 31 years and counting. The Club was able to award $6,000 worth of scholarships to three deserving senior high school students. The club also helped support other community events such as the “Before the Fall” contest at Bethune Beach and provided funds for mission work in Nicaragua. Surfari fund-raisers included two annual contests, the Seaside Fiesta and Halloween Spooktacular. The Club also held four beach clean ups in 2010, and added a new clean-up area this year, covering an entire mile directly south of the Inlet jetty, where the Kona Pro will be held.